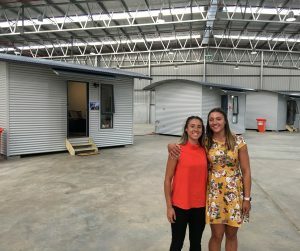 Contestants on the popular TV show The Block had their work cut out for them in Bendigo as they faced a Kids Under Cover Studio Challenge. South Australian couple Kerrie and Spence were crowned the winners of the Charity Challenge! All BLOCKheads went above and beyond to deliver stylish, comfortable and tranquil spaces for young people at risk of homelessness. Kerrie and Spence created a beautiful space for a 17-year old girl in desperate need of some privacy and stability. Leaning on good sports Bianca and Carla to complete the room by signing a netball just in the nick of time, for this netball loving teen. Bianca and Carla stylishly fitted out their studio with a 16-year old boy in mind. Including a basketball hoop within a plush space, he can now call his own, read more. 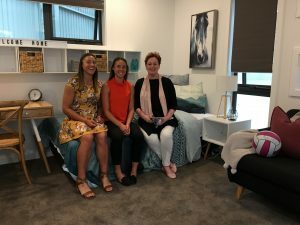 Hayden and Sara pulled out all stops, calling on a relative in Melbourne to deliver a special something for the Melbourne Victory fan who will be calling their studio home, read more. Courtney and Hans also thought outside the square when decorating their studio for a 15-year old girl who loves ballet. These BLOCKheads called on the help of local dance supply boutique Dance Your Way to deliver a beautiful pair of ballet slippers to hang on the wall, read more. And Norm and Jess, well these guys delivered a very cool pad for a 16-year old boy who enjoys playing video games inspired by action and zombies! Read more. All BLOCKheads worked hard for the entire 8 hours (even if some spent most of that time shopping up a storm in town!) to deliver thoughtful, generous spaces for these at-risk young people. These studios will have a significantly positive impact on the lives of the five young people who will now be calling them home. Thank you. And what an incredible job the BLOCKheads did converting five studios into homes for at-risk young people. Congratulations & thank you! Your hard work & genuine desire to make a real difference for at-risk young people was truly heart-warming.